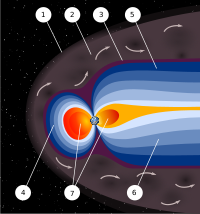 What is the diameter of magnetopause 1.5 millions kilometers behind the Earth? My question - what is geometry of magnetotail, if we check it 1.5 million kilometers away from Earth (at the line Sun-Earth-L2). What is estimated diameter of magnetopause or magnetotail here? Will Earth provide extra protection from charged particles for the spacecraft hung exactly in L2 Lagrange point of the System Sun-Earth. 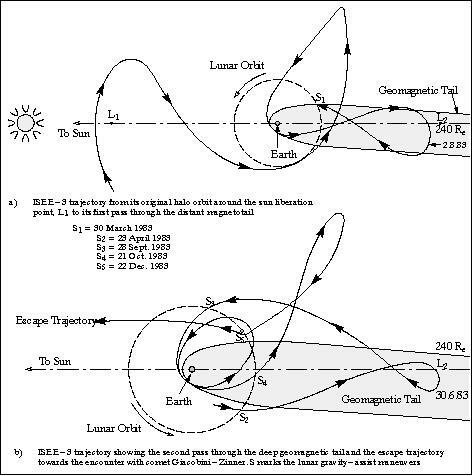 Some interesting info from ISEE-3 via eoPortal: https://directory.eoportal.org/web/eoportal/satellite-missions/i/isee from the figure 12 "ISEE-3 spacecraft trajectory overview from halo orbit to geomagnetic tail"
If the tail is depicted correctly, its diameter near L2 is ~1.5 times less then Moon's orbit diameter (0.77 mln km), or near 0.5 million kilometers. The The Global Magnetosphere page from "Earth's Magnetosheath, Magnetopause and Magnetosphere" lecture by Iver Cairns, 1999 has interesting picture "Figure 14.7: Noon-midnight cross section of the magnetosphere and geomagnetic tail [Hughes, 1995]. Magnetic field lines are shown using solid lines while the dashed lines shows particles moving along the field subject to the ...", and I think that sizes are in R_e units (6400km). The original source of this figure is Hughes95, http://www.ss.ncu.edu.tw/~lyu/lecture_files_en/IntroSpacePhysics_KivelsonRussell/SPIntro/SPIntro_9_new.pdf page 232 (he taked the picture from "Pilipp and Morfill 1978"). The "X line" point is located near 115 R_e. Moon orbit semi-axis is at 60 R_e (60 Earth radii). Sun-Earth L2 is 240 R_e, so we can expect something around 60 R_e diameter of Magnetopause at L2. 200,000 - 300,000 km halo orbit around L2 is equal to 30-40 R_e. So I can conclude that Earth magnetosphere may cover the exact L2 point. But at the same time, it is unlikely to give much protection or constant protection to the satellite orbiting so far from L2 (actually, it is periapsis of halo orbit parameters of the Gaia). Not the answer you're looking for? Browse other questions tagged radiation lagrangian-points the-sun or ask your own question. What are reasons to put Gaia space telescope into L2 Lagrangian point of Sun-Earth system? What plane will DSCOVR’s orbit be in? Are large halo orbits around L₁'s and L₂'s preferred over small orbits for reasons other than geometry? Are (some) Halo Orbits actually Stable? Did ISEE-3 spend a few years in a halo orbit around sun-earth $L_1$ without using any fuel? How far would the Mars L1 Lagrangian Point be from Mars?